Nokia the world’s largest mobile devices company has lately been on receiving end with regard to smartphone segment owing to their ageing S60 platform. Apple changed the way people looked at smartphones after they launched iPhone; after iPhone’s launch every new smartphone is always benchmarked against the iPhone. The iPhone was innovative and surely did capture huge chunk of the smartphone market segment. Nokia introduces the N900 which is a smartphone rather a mobile computer that is powered by Maemo OS which is based on Debian Linux and the GUI is derived from various frameworks and libraries from Gnome project. Maemo uses the Matchbox window manager, and GTK-based Hildon as its GUI and application framework. 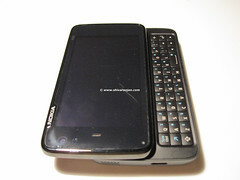 The Nokia N900 is basically a internet tablet with telephone functionality and it is the successor to the internet tablet N810 which also powered by Maemo OS. When you handle this phone for the first time you will feel that it is a brick as it weighs 181g and with the dimensions 110.9 × 59.8 × 18. 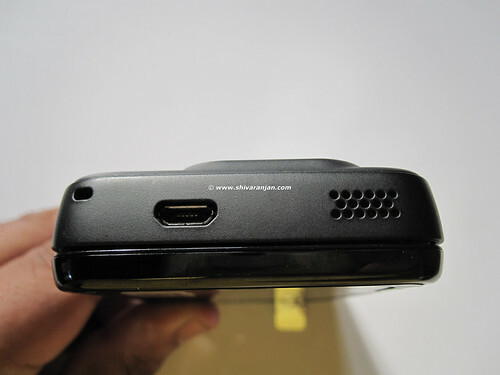 Though it looks like a brick, when it is in your palm you get a very solid and firm grip on N900. The N900 is not the most sleek and good looking phone but it does pack a punch with in the broad frame that it is made up of. If you use the phone in portrait mode then you will feel that the buttons are placed incorrectly but as this phone is derived from the earlier Internet tablets like N770, N810 etc and is meant to be used in landscape mode rather than portrait mode. 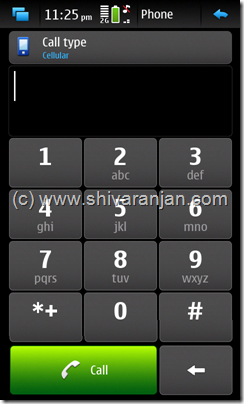 There is no hardware buttons for answering or ending the call which is usually available in all Nokia phones and if you notice there is no hardware menu button on front side of the phone. The right hand side of the phone when held in portrait mode has got power button, camera button, volume control and infrared port. If you observe that power button usually placed on top of the phone but in this phone it is placed on the right hand side, but when you hold the phone in landscape mode the power button would be on top. So this implies that the phone is meant to be used in landscape mode and this also gives insight into the N900 predecessors which is N810. 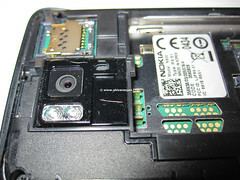 On top of the phone you can see the micro USB port using which you can charge your phone and connect to your computer in Nokia PC suite mode or mass storage mode , also notice the speakers are towards the right side. The bottom of the phone houses 3.5mm audio jack (also doubles as TV out), stylus compartment, lock/unlock slider and the speakers. 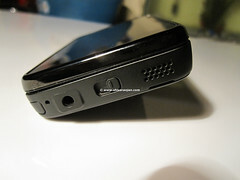 The phone comes with two stereo speakers housed on top and bottom of the phone. The audio quality from these speakers are very good and loud hence you will never miss a call. Using the phone with headphones plugged in in landscape mode is uncomfortable, the 3.5mm jack could have been placed on the right side of the phone. Though this phone has got a resistive touch screen but we never felt the need to use the stylus as the screen is very responsive and very much finger friendly. 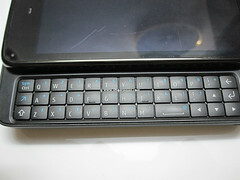 The phone comes with a hardware QWERTY keyboard which slides out from the main body and is solid and very comfortable to use but has only got 3 rows of keys, a fourth row could have been better. 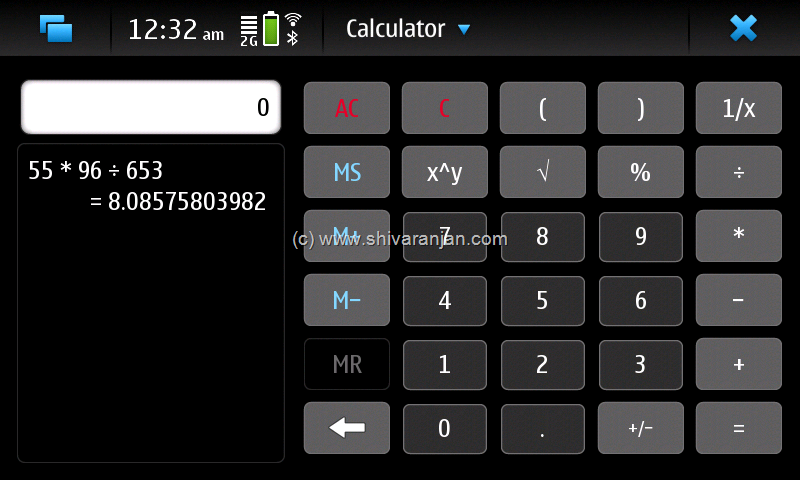 If you are migrating from N97 then it will take some time to get used to this keyboard. There is no Dpad on the keyboard which is a usual feature of all N Series keyboard, gamers would be disappointed by this keyboard. The space key is wrongly placed i.e. towards the right side of the keyboard instead of center of the keyboard and can prove uncomfortable at times. 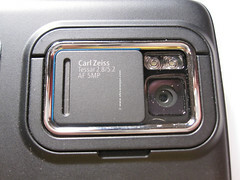 On the back side 5 megapixel camera with Carl Zeiss optics, Tessar lens and Dual LED flash is housed. 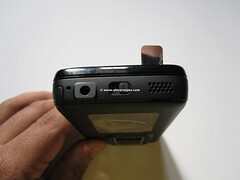 Camera lens is protected by a sliding lens cover which in this case does not scratch the camera lens as the camera is recessed on the surface whereas this was an issue in N97 where the camera lens was scratched due to the sliding lens cover. There is a kick stand using which you can set the phone in angular position which is more suitable for watching videos, the kick stand is held to body by a magnet which holds it in place when the stand is not in use. 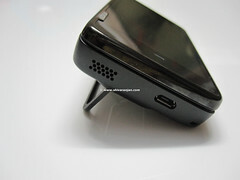 The kick stand is not placed in center hence the phone feels bit unstable while using the kickstand. 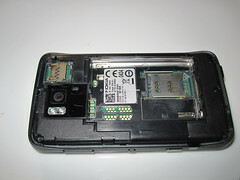 The MicroSD card slot is on rear side placed near camera, you would have to remove the back panel to access the MicroSD card lot. 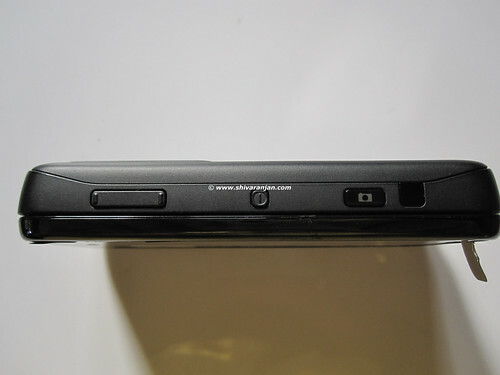 I felt that it would have been better if the MicroSD card slot could have been placed on the side panel of the phone as it would have been easier to use the MicroSD card slot. 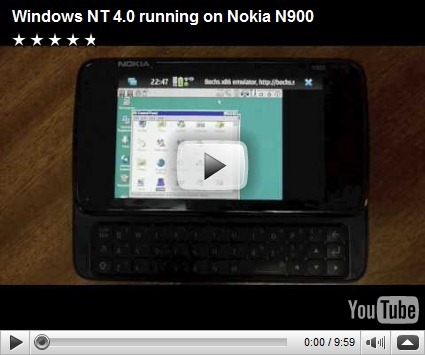 The N900 is powered by Texas instruments CPU TI OMAP 3430: ARM Cortex-A8 with PowerVR SGX 530 GPU (with support for OpenGL ES 2.0) which clocks at 600Mhz, when I look back at my very first computer which was powered by Intel Pentium II it just clocked at 350 Mhz. The more detailed information about TI OMAP 3430 can be found here. The phone comes with 256MB RAM and 768MB virtual memory which totals to 1GB of memory available for applications this when combined with 600MHz ARM Cortex A8 CPU makes the phone a monster. You can see the available amount of RAM in the below screenshot. The N900 comes with a 32GB onboard storage which is more than sufficient for all your photos, videos and music but if you need more space then you can pop in a 16GB MicroSD card in the card slot so that it makes the total storage capacity to 32 GB + 16 GB = 48 GB. 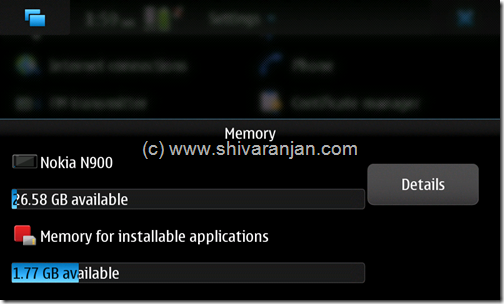 Even though N900 offers huge amount of storage the memory available for installing applications is limited to a max of 2GB, which I feel is more than sufficient. The N900 comes with a 3.5 inch resistive touch screen with 800×480 pixels resolution. 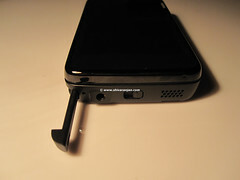 The touch sensitivity of the screen is very good and better than the N97, I never felt the need to use the stylus. A capacitive touch screen would have been a better option but I don’t regret it as the 3.5 inch resistive is very nice but the phone does not support multi touch. The noteworthy thing to note here is that even though the display uses resistive technology, Nokia has managed to fine tune display very well. The N900 has comes with a wide range of connectivity options, the GSM module supports Quad-band GSM EDGE 850/900/1800/1900 and WCDMA 900/1700/2100 MHz . N900 has a Bluetooth, infrared and Wi-Fi (802.11a/b/g) connectivity options at your disposal which can be accessed and used with ease. The GPS functionality uses the A-GPS method and is very quick to get a lock on your position, it took around 12 secs to get a lock from a cold start and around 8-9 secs from hot start. 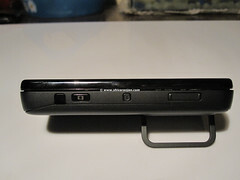 The N900 can be connected to the computer via USB cable and two options are available PC Suite mode and USB mass storage mode. 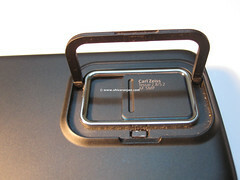 The PC suite mode is used for syncing with your computer where as the USB mass storage mode connects as a mass storage and offers high speed data access to the built in 32GB memory card. The most interesting thing to note here is that the N900 comes with very powerful cellular and Wi-Fi antenna which picks up even weak signals, the N900 was able to pick up GSM/UMTS and Wi-Fi signals even when the iPhone and the N97 failed to pickup. 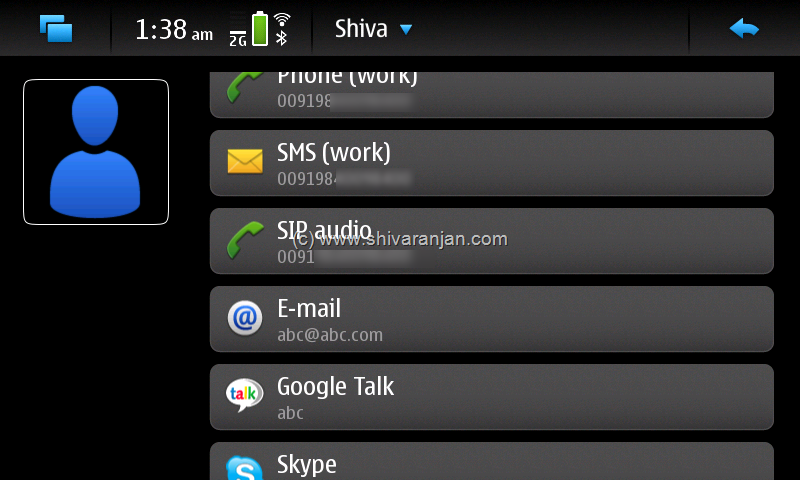 There is support for Bluetooth 2.1 with EDR (support for stereo Bluetooth headsets). The battery life usually depends on the way you use your phone, I felt that my Nokia N97 gives a better battery life and the reason may it is powered by a 1500mAh BP-4L Lithium-polymer battery. 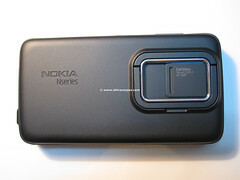 In my opinion Nokia should have used the BP-4L battery that powers the N97 and some of the E Series phones. Maemo is a software platform developed by Nokia for smartphones and Internet Tablets.It is based on the Debian Linux distribution. 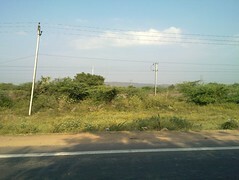 The platform comprises the Maemo operating system and the Maemo SDK. Maemo is mostly based on open source code, and has been developed by Maemo Devices within Nokia in collaboration with many open source projects such as the Linux kernel, Debian, and GNOME. 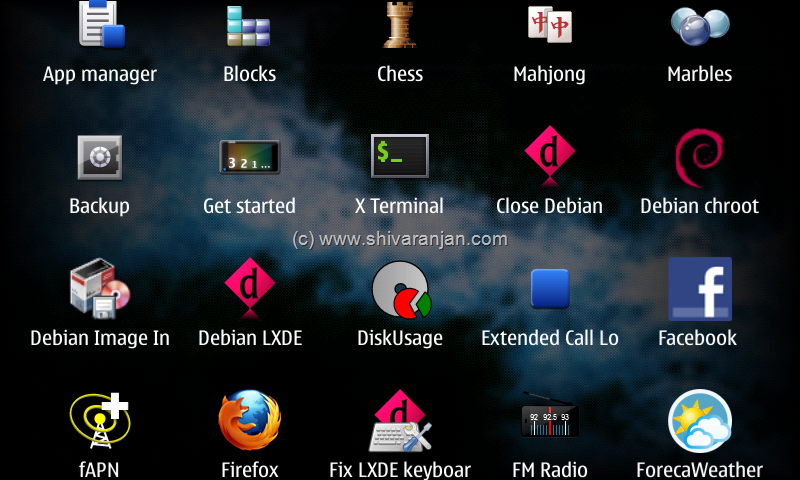 Maemo is based on Debian GNU/Linux and draws much of its GUI, frameworks, and libraries from the GNOME project. It uses the Matchbox window manager, and the GTK-based Hildon as its GUI and application framework. The UI in Maemo 4 is similar to many handheld interfaces, and features a “Home” screen, which acts as a central point from which all applications and settings are accessed. The Home Screen is divided into areas for launching applications, a menu bar, and a large customizable area that can display information such as an RSS reader, Internet radio player, and Google search box. 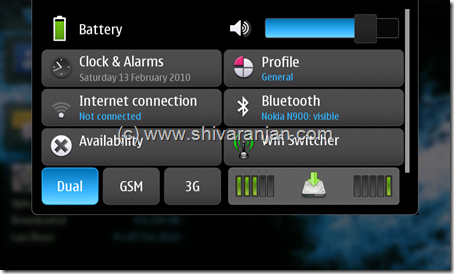 The Maemo 5 UI is slightly different: The menu bar and info area are consolidated to the top of the display, and the four desktops can be customized with shortcuts and widgets. 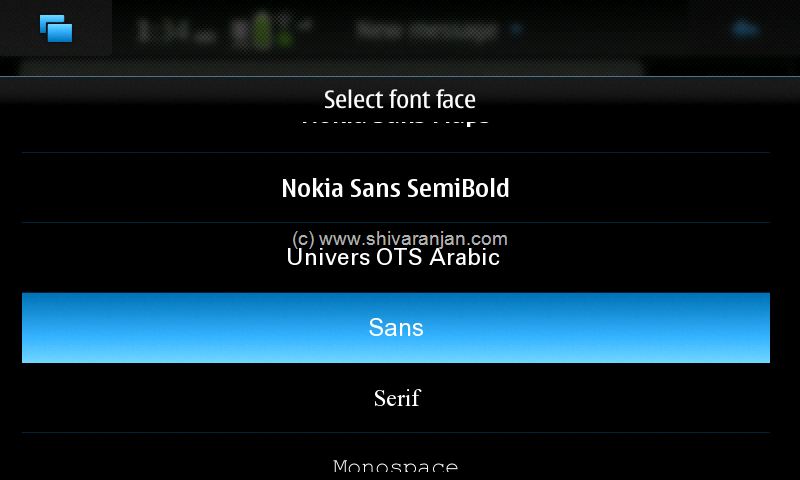 The N900 as it runs on Maemo 5 has a got different UI when compared to the S60 OS. 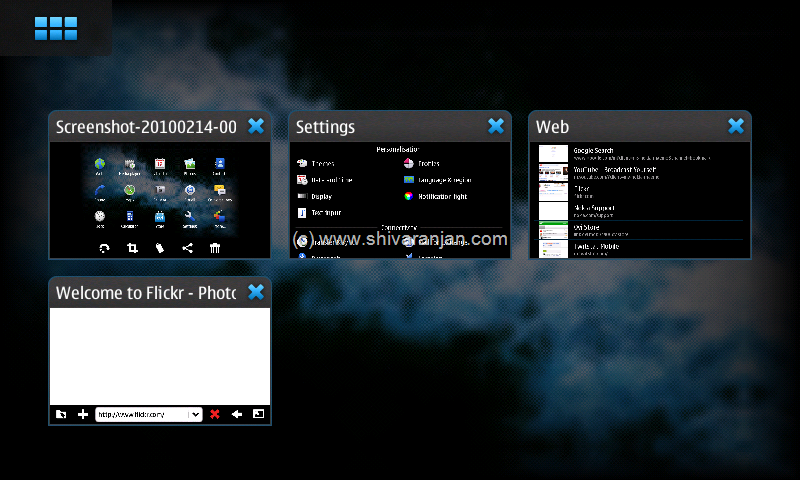 The panorama desktop allows you to have four home screens or desktop panels which can you customize to your own needs. The four desktops can be accessed by swiping the finger from left to right or right to left on the home screen. 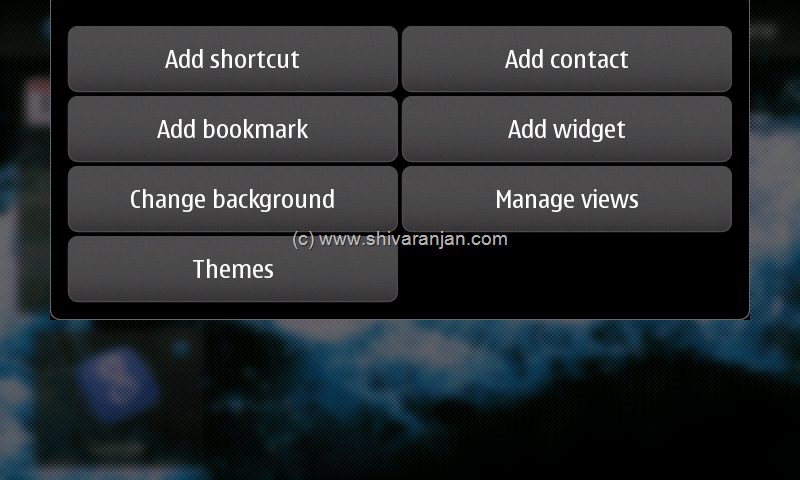 On Maemo desktop you can add application shortcut, contacts, application widgets and bookmarks. 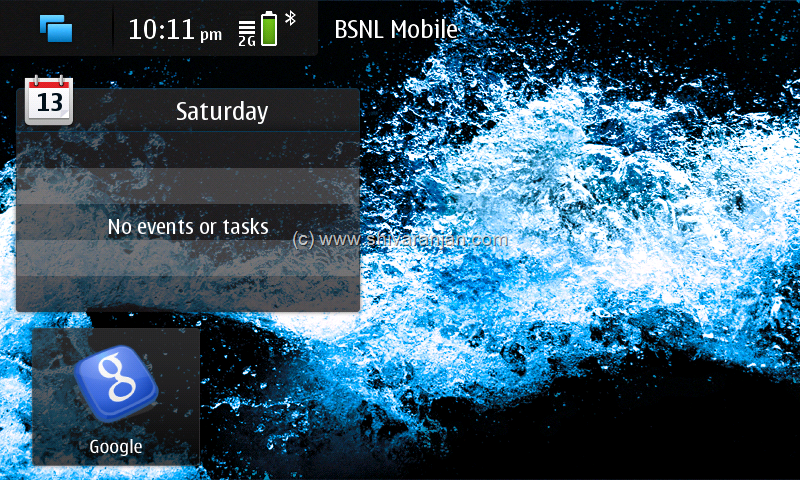 On top of the screen you can find the status bar which displays battery charge status, access to clock/alarm, ability to change profile, quick access to Internet connections, IM status availability, bluetooth access. 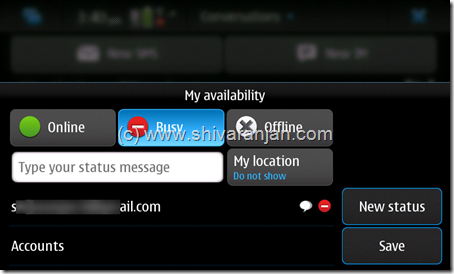 In case you install applets then additional features can be made available on the status bar. In this case I have installed applets to quickly switch to Dual, GSM and 3G modes, Wi-Fi ON/OFF access and CPU / RAM usage applet. The top left of the screen can be used to access the application menu and dashboard, tap it once dashboard (task manager) will come up and display all the applications that are running and tap it twice you will be presented with application menu. 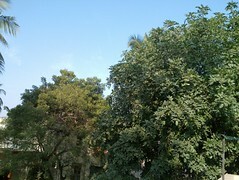 The N900 is designed (as of now) to work only landscape and the portrait mode is currently available only for the telephone application. This can be a set back to some people who prefer to work on apps in portrait mode rather than landscape mode. 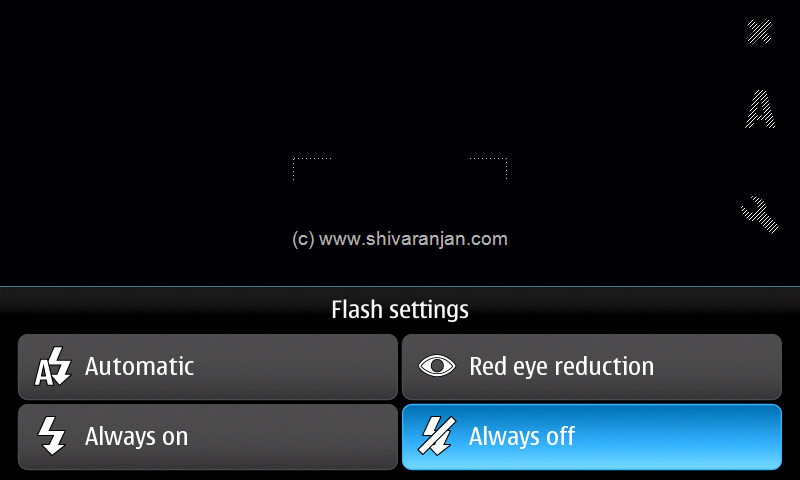 Nokia is working on portrait mode for all apps and may be addressed in the future firmware updates for N900. The Maemo 5 comes loaded with Xterminal using which you can execute powerful scripts and commands that you typically run over desktop computers. 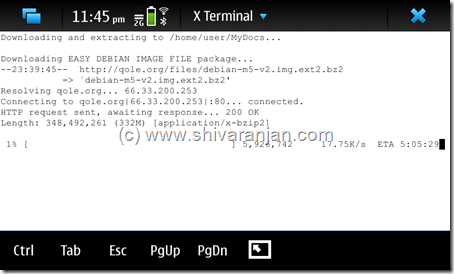 The Xterminal gives you root access to Maemo 5 after you install the required packages and all the commands that run on a Debian based OS can be executed on Maemo 5. The N900 should not be considered as a smart phone rather it should be called as Internet Tablet with telephone functions. 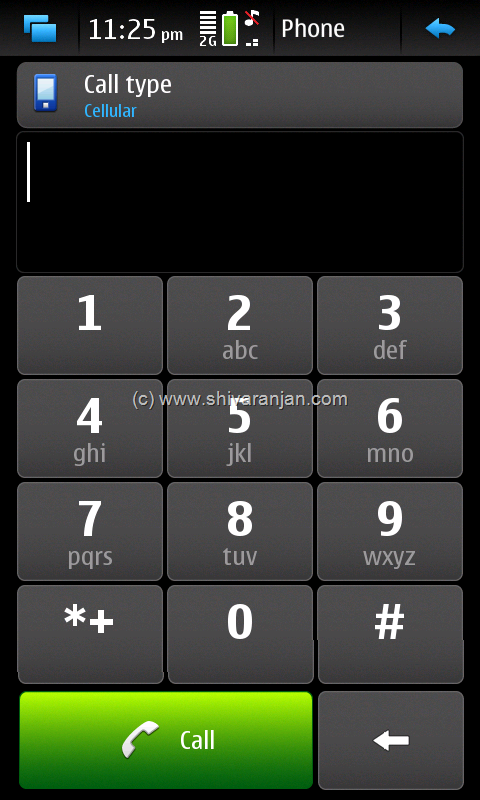 All phone features like Integrated hands-free stereo speakers , Call waiting, call hold, call divert, Call timer, Logging of dialed, received and missed calls , Speed dialing, Vibrating alert , Mute/unmute, Conference calling with up to 3 participants and Internet calling (VOIP / SIP) can be found in N900. 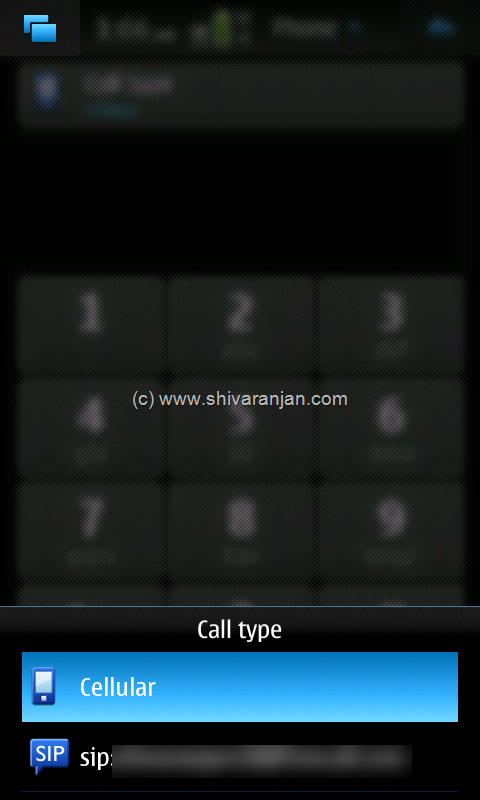 When the phone mode on N900 is active, you can find access to Dialing pad / Dialer, access to Contacts and call logs are displayed. When ‘Call type’ is tapped it will present all the available calling options like cellular, SIP or other VOIP services if the user has configured it. The integration of VOIP / SIP with Cellular telephony is one of the strongest feature of N900. 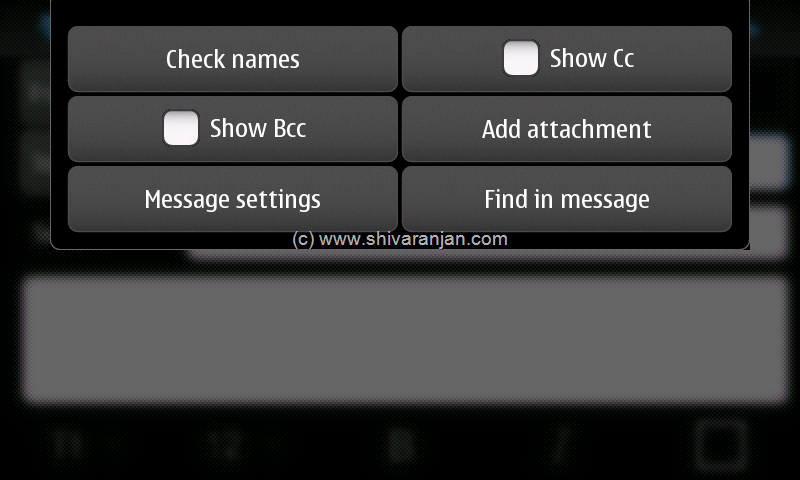 The contacts are by default listed in alphabetical order, you can use the keyboard to type and search your contacts. 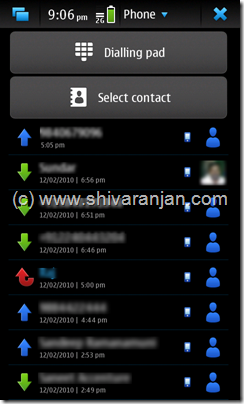 On contact menu you will have option to display the contacts by alphabetical order, based on online availability and recently added contacts and you can categorize the contacts into groups. 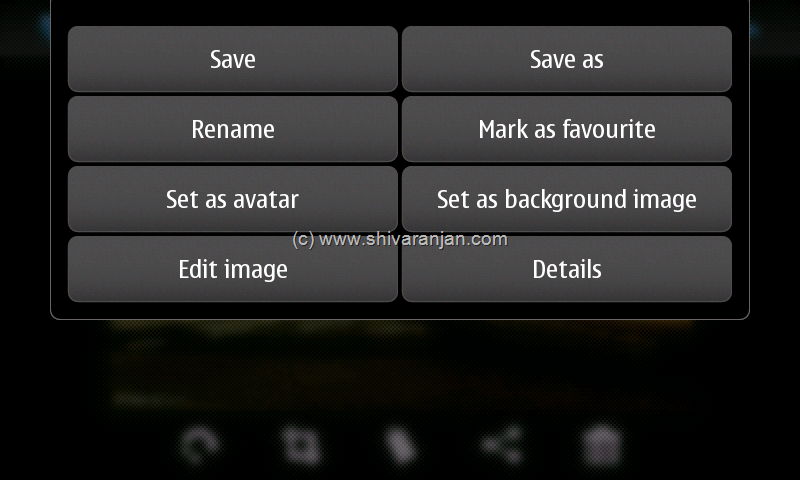 The ‘Export’ option can be used for transferring the contacts from Phone to PC or any other compatible device. 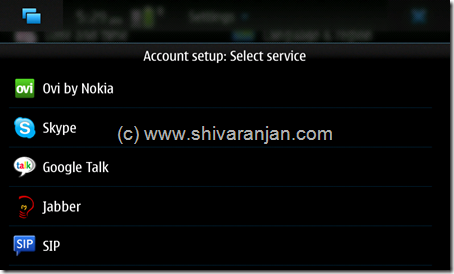 Detailed information for each contacts can be added which includes the Gtalk, Skype and other IM accounts, there is no speed dial available similar to other Nokia phones instead you can add the contact to desktop panel as a shortcut. 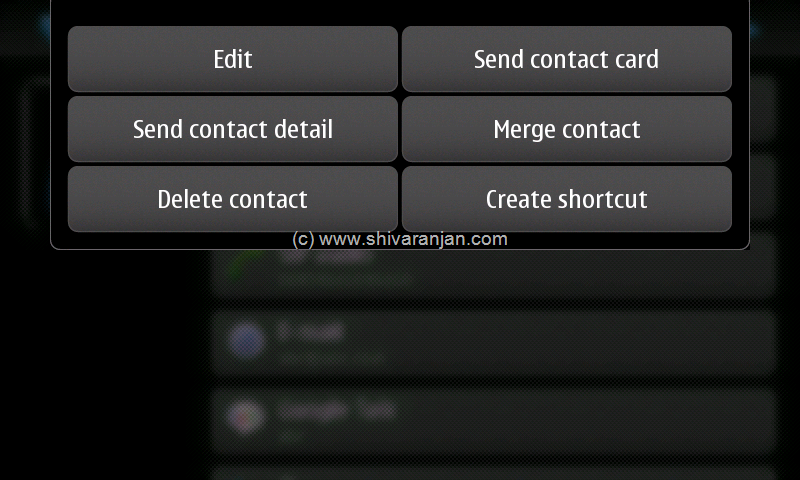 You can merge two contacts using the ‘Merge Contact’ which I found pretty useful to take care of duplicate contacts. 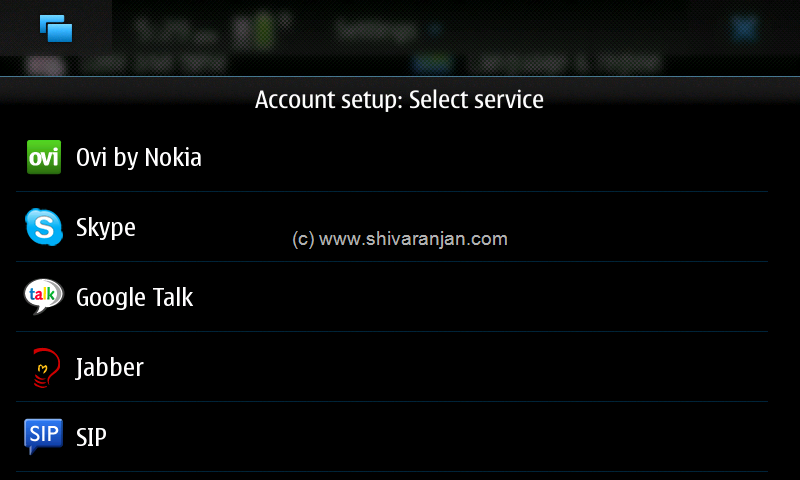 Nokia N900 supports SIP, Skype, Google Talk, Jabber and Ovi accounts out of the box so you can add all your IM contacts quickly and stay in touch with your contacts. The IM account status can be set right from the status bar for all of your accounts and option to input your custom status message is also available. 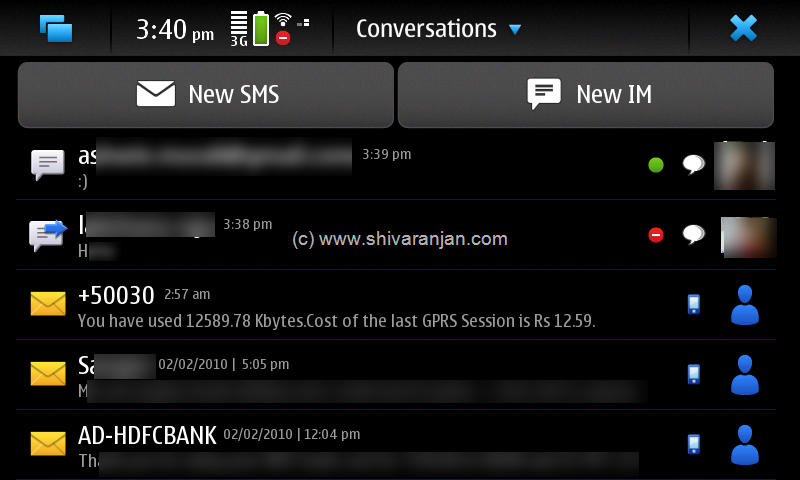 Text messaging and instant messaging are grouped under conversations, the messages can be distinguished by the icons that have been used to for each type of message. 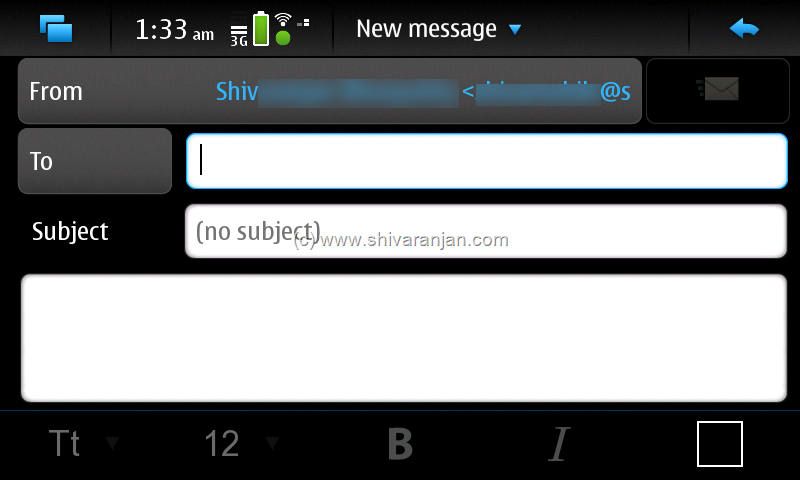 New SMS / Text message and New IM can be opened right from the conversations home page. When a SMS is tapped once it displays the message and you can reply to the message using the text input box in on the bottom of the screen. 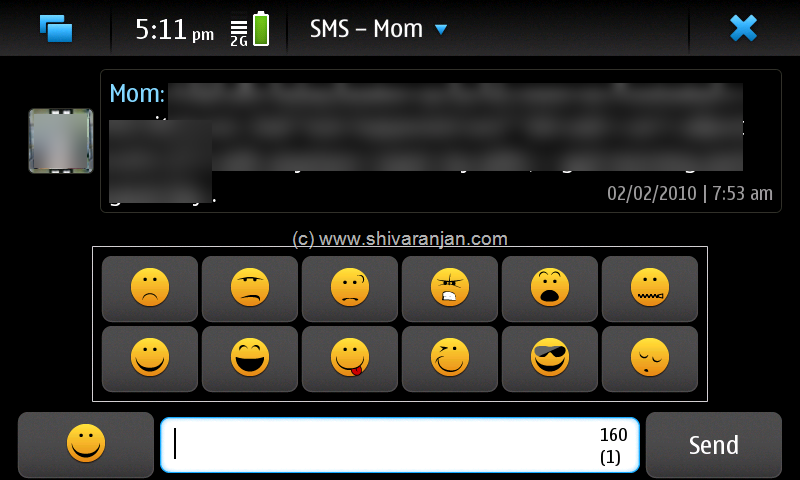 If you are a person who uses lot of smiley’s, you can insert them quickly using the smiley button. The SMS can be deleted, copied or forwarded if the message is tapped twice. 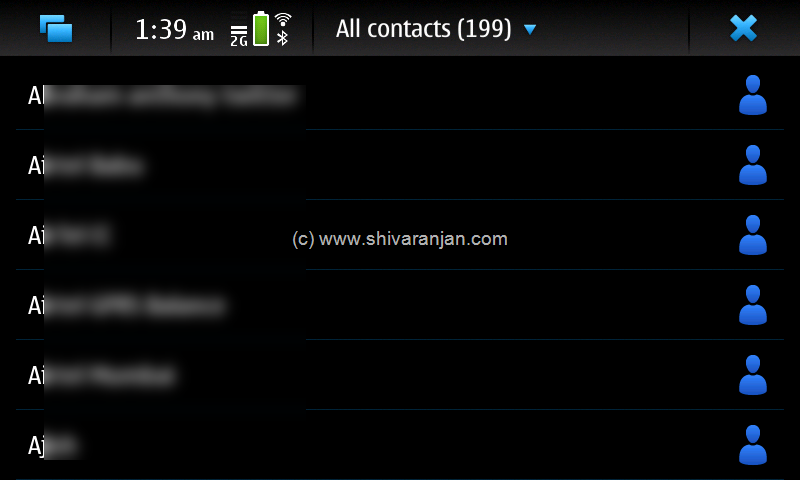 All the SMS and IMs from a contact are stored as threaded conversations, a feature that I loved very much. 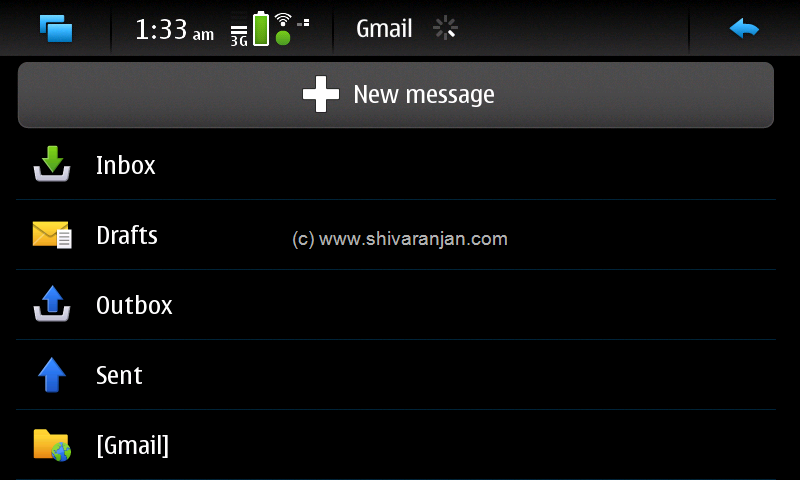 The N900 comes with Email support for Mail for Exchange, IMAP, POP3 and SMTP protocols and supports rich HTML emails. 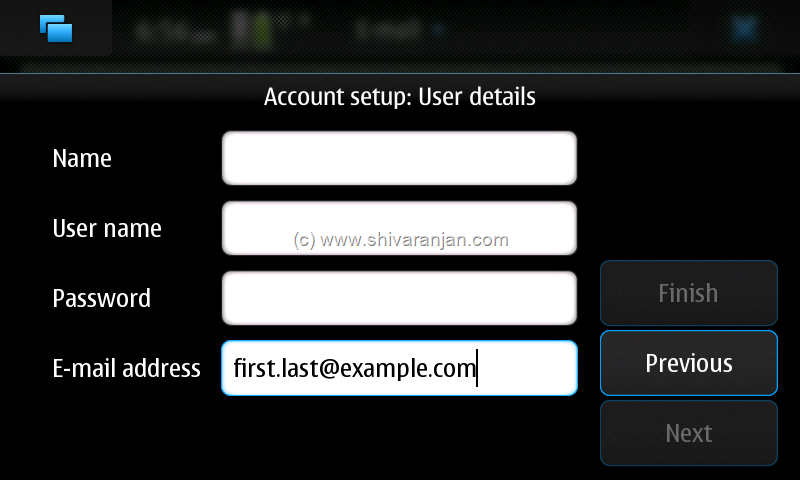 Email setup on the N900 is very simple, all you have to do is enter your email address with username & password the email is setup quickly. I was able to configure Yahoo, Gmail and Mail for exchange very quickly and I did not have to enter any settings manually. 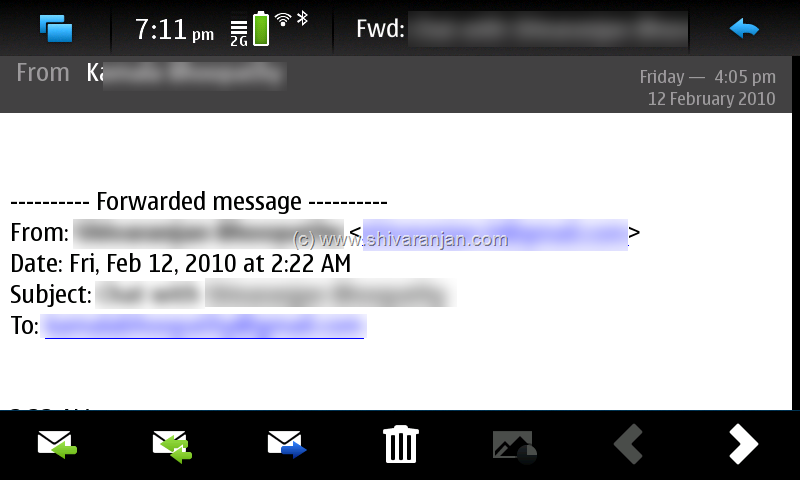 Emailing on N900 is nearly desktop class, when you compose a email you can choose the account from which the email has to sent, control the priority of the email (low/high/normal), choose the fonts and select the fonts that you intend to use. 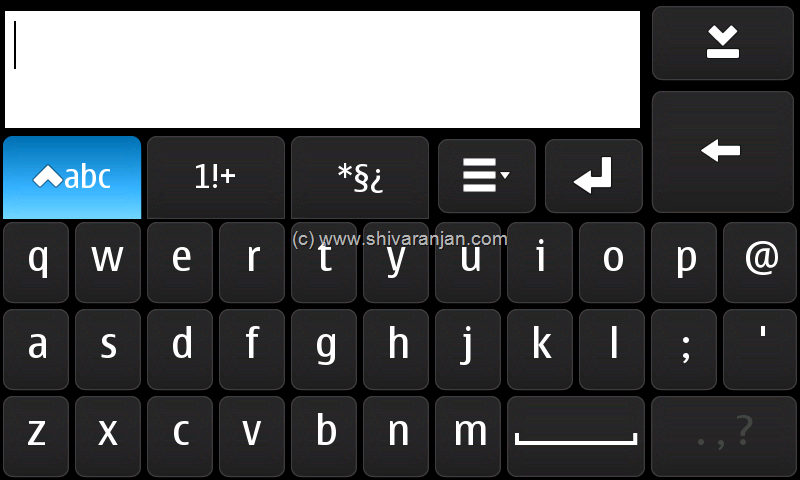 As the phone has got a full QWERTY hardware keyboard composing emails is pretty quick and easy and for those who find the hardware keyboard uncomfortable you can use the N900’s virtual keyboard which is also very sensitive and easy to use. 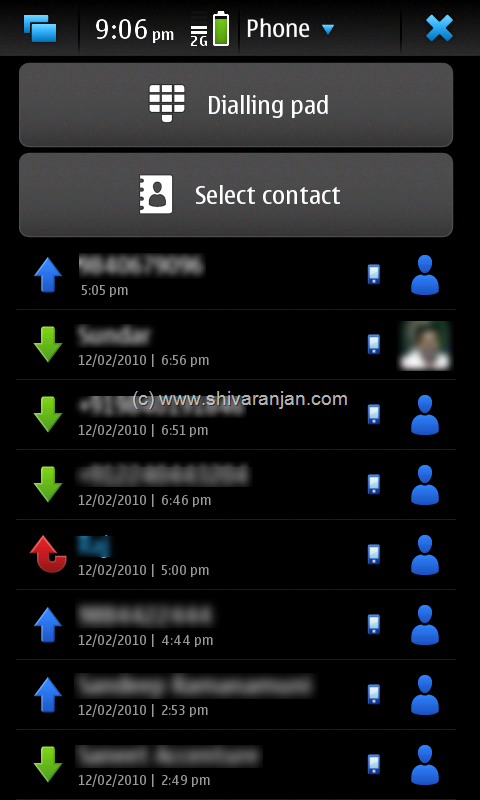 Strangely there is no native support for the MMS messages, I am not sure why Nokia left it out, but you need not worry as there is app called fMMS on Maemo repository using which you can send and receive MMS messages. 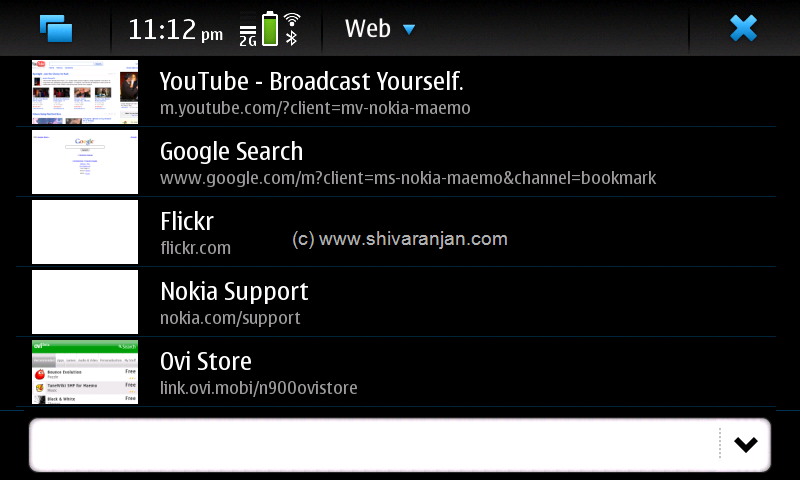 Web browsing is an area where no other phone at present matches Nokia N900. The N900 comes loaded with powerful MicroB web browser which is a based on Mozilla technology and you can enjoy desktop class browsing on N900. The MicroB comes with support for Adobe Flash 9.4 hence all the flash based website load without any issues on the web browser. MicroB coupled with the powerful hardware results in blazing fast rendering of web pages, if you have used the S60 web browser that comes with Symbian based phones then you will have all together different web browsing experience. 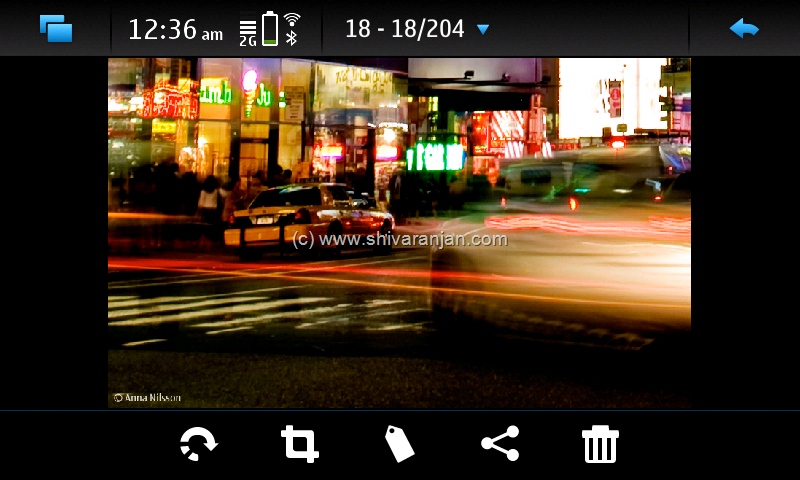 The browsing on the gorgeous 3.5 inch with generous 800×480 pixels resolution is very pleasing. The address bar, add to bookmark, bookmark access, back button and full screen browsing buttons are all placed on the bottom of the screen for quick access. While browsing if you hit the back button you will be presented all the websites that you had visited in the current browsing session as small thumbnails, tap on those thumbnails you will redirected to that page. While browsing to zoom into a section of the webpage just tap twice it will be zoomed in and if you tap twice again you will zoom out, additionally you can do spiral gesture towards right for zoom in and towards left to zoom out. A new browsing window can be opened by tapping the menu available on the top of the screen and browsing actions like Find on Page, Reload, Save page as, Download manager and options can be found. 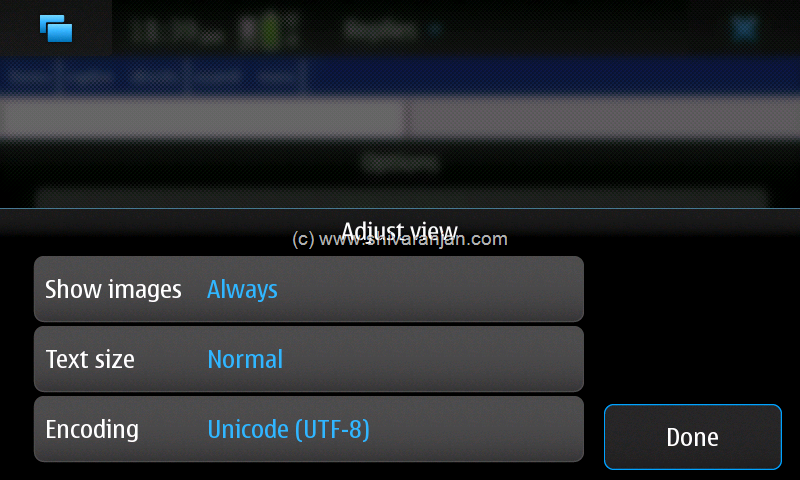 MicroB’s options menu has got settings for adjusting view, Add-ons, browser settings and clear private data. As MicroB is based on Mozilla browser there is option to install extensions and plug-ins but currently there not much extensions available to install on the MicroB but in future more number of extensions and plugins can be expected. There is no need for a separate YouTube app as the MicroB comes with Adobe Flash 9.4 and YouTube works as it works in your Desktop computer. The N900 comes loaded with all multimedia functions like Music Player, Video Player, Internet Radio and Camera with video recording. The N900 comes with a 5 Megapixel camera that can take pictures with a max resolution of 2584 × 1938 pixels with autofocus support. 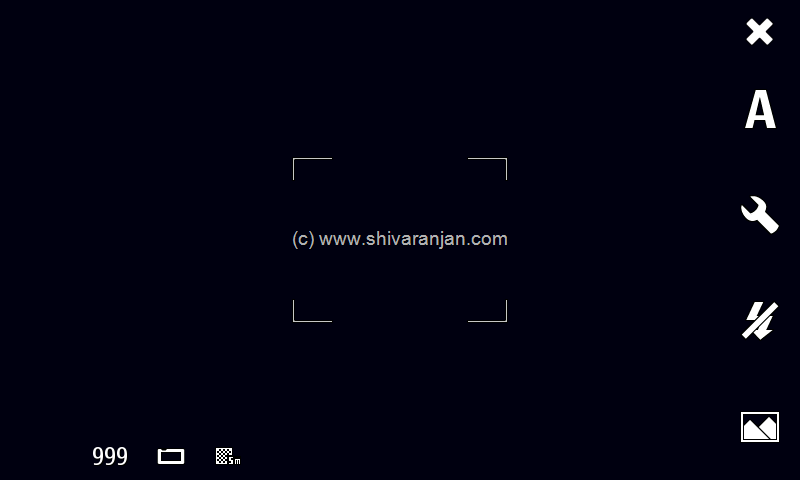 The camera captures video at resolution of 848 × 480 pixels at 25 fps with 16:9 aspect ratio. 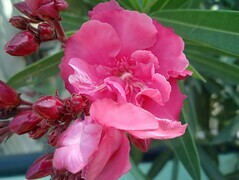 The camera can be used in Automatic, Portrait, Action, Macro and landscape modes. 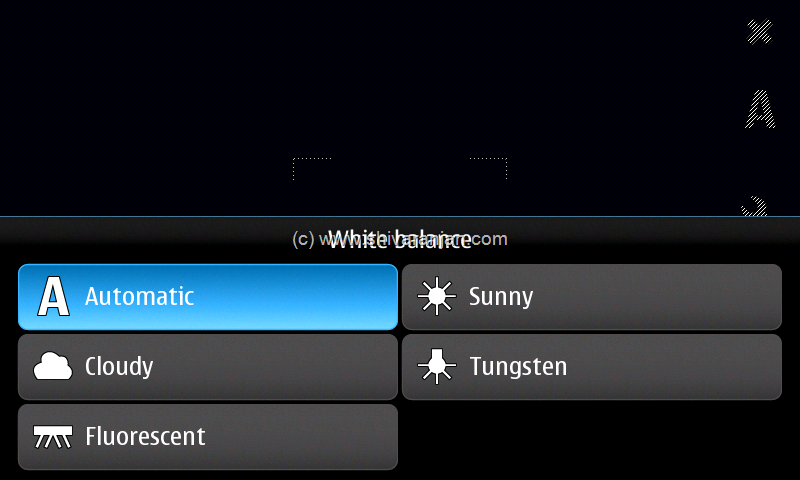 While taking the photos you can adjust the white balance with the preset options like Automatic, sunny, tungsten, cloudy and fluorescent. 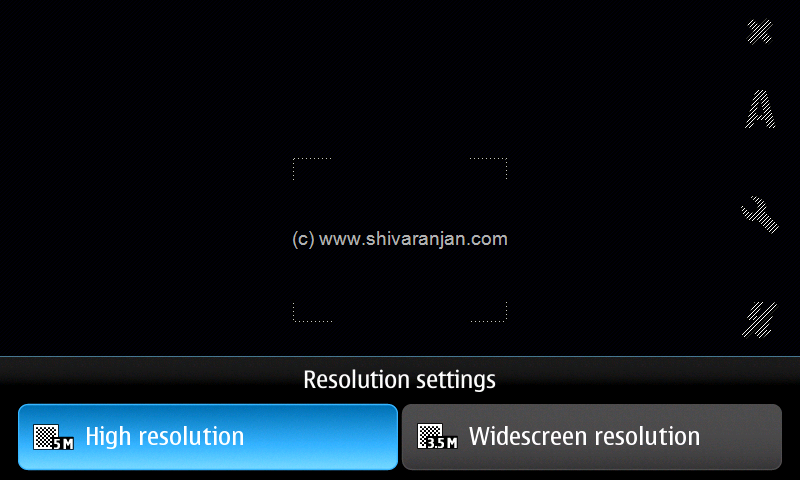 The camera can take photos in only two resolutions 5 megapixel and 3.5 megapixel (in widescreen mode). 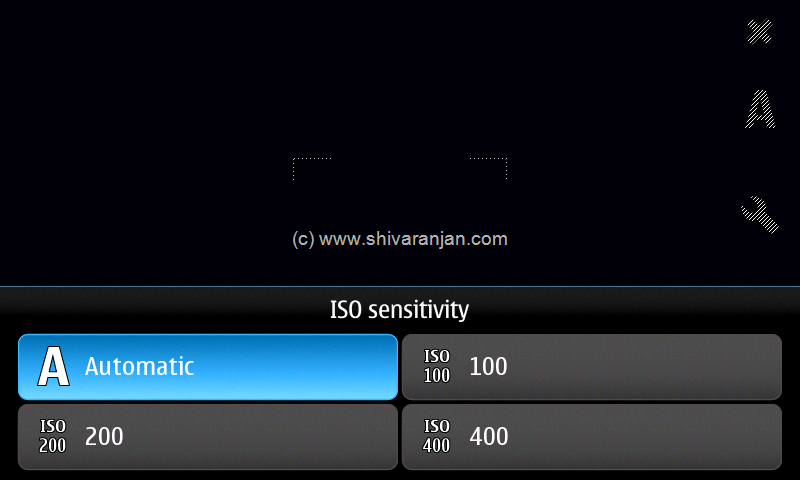 The N900 allows you to capture images in ISO100, ISO200 and ISO400 modes when used manually. 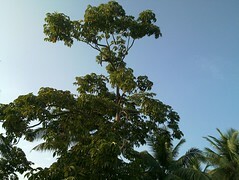 The image quality is better or on par with the 5 megapixel camera that comes with the N97. More sample photos can be viewed here. 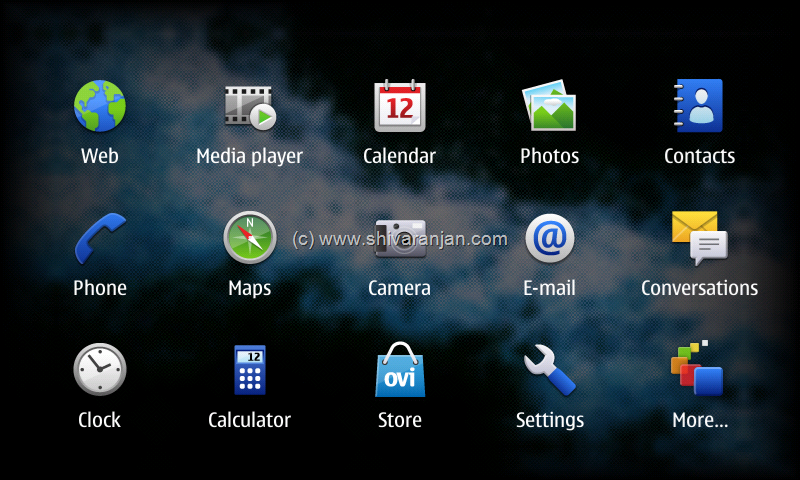 N900 comes with photo application using you can manage all the photos/images that are stored on your phone. All photos/images are displayed as thumbnails and tapping the image opens up the photo. 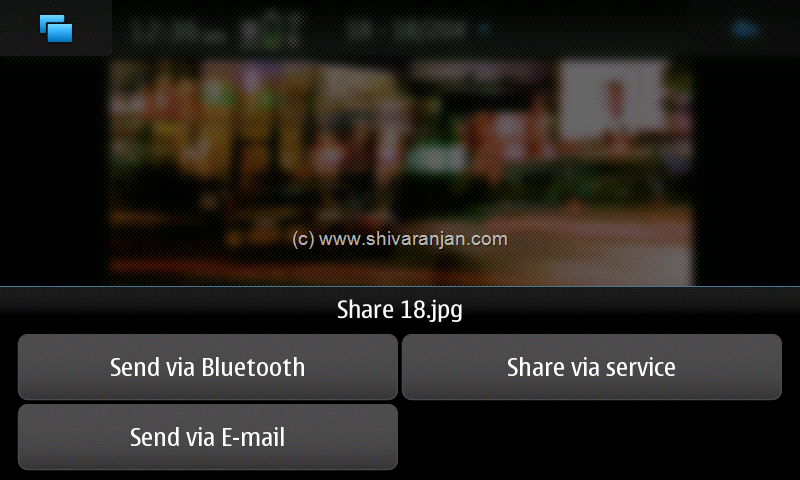 The application offers basic features like rotating, tagging, cropping and sharing the photos. The photos can be shared using Bluetooth, email and services; many photo sharing applications like Flickr, Twitpic and etc can be configured so that the images can be uploaded to these sites. 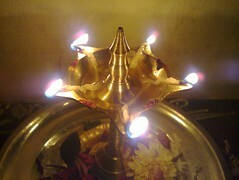 In addition to these the images can be renamed, set as background image, set as avatar and edited. 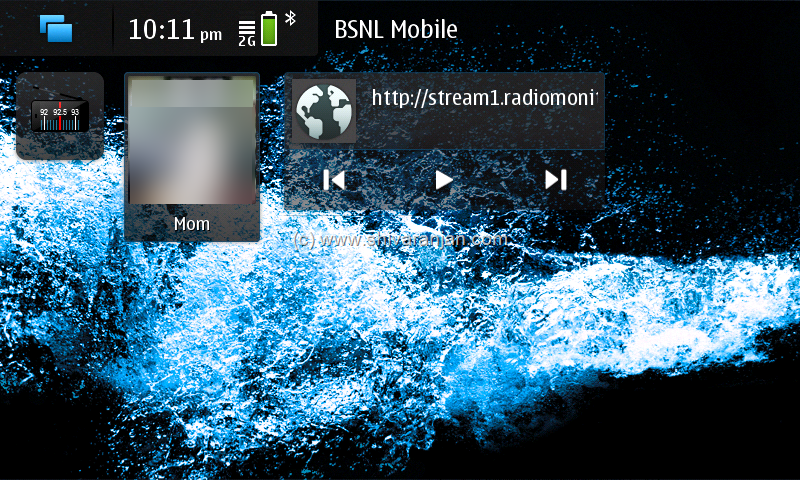 Music and videos in N900 is handled by media player that can play all your audio, video and even internet radio. The media player handles audio files of these types .wav, .mp3, .AAC, .eAAC, .wma, .m4a, The media player is pretty straight forward to use with controls for playback, repeat track, pause, next/previous track and shuffle playlist. 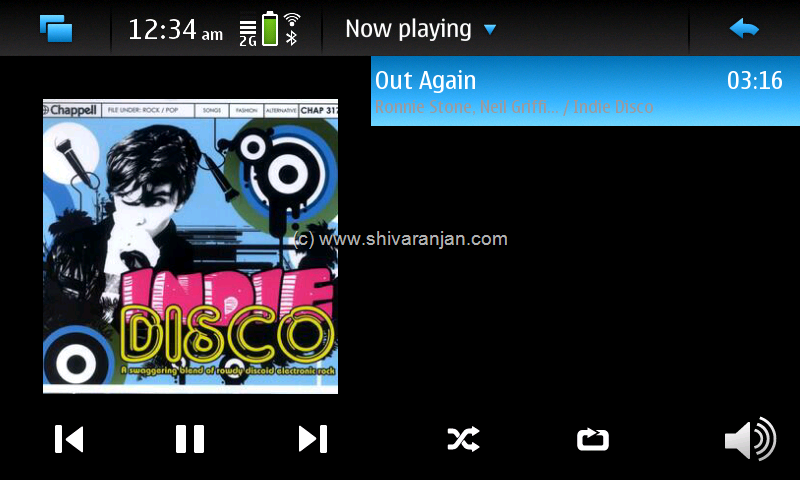 The album art of the track is displayed on the left side of the screen and there is no option to add your album art which is something that is possible in N97 music player. 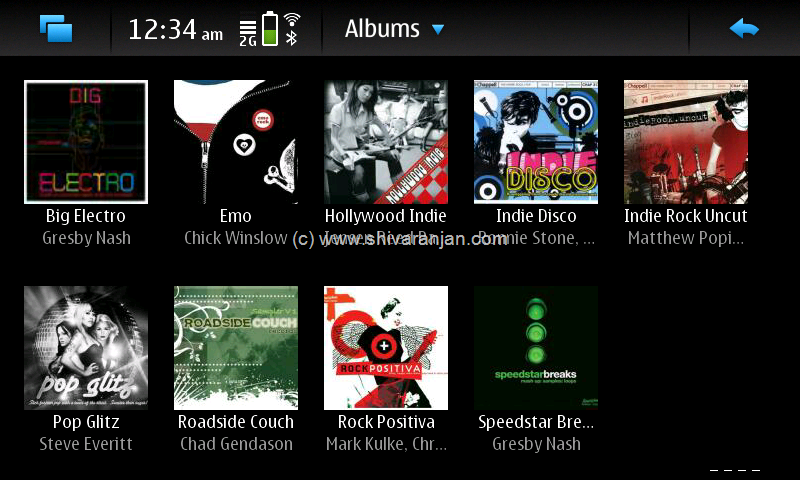 The audio quality is great and as N900 comes with 3.5mm jack I could plug-in my Creative EP-630 and enjoy music. Surprisingly there is no equalizer which can be a huge setback to music lovers and I hope this is addressed in future firmware updates. 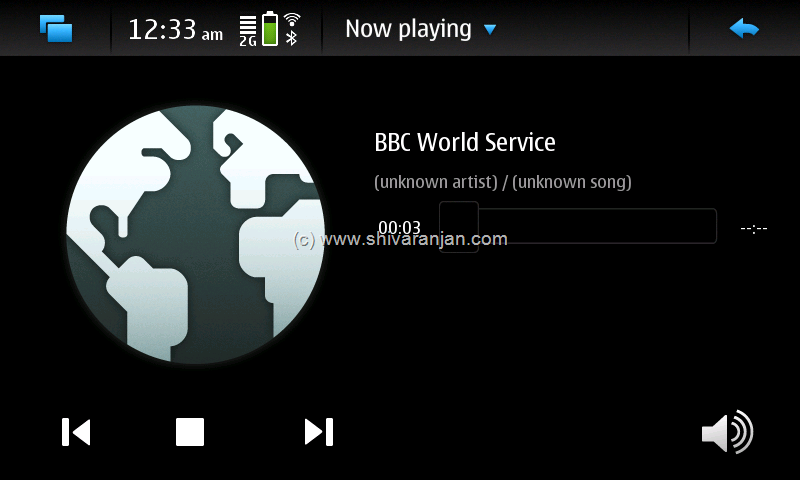 The integration of Internet Radio with media player is one feature that i liked the most, the N900 comes preloaded with few Radio stations; if you don’t like those just delete those and add your favourite radio stations. 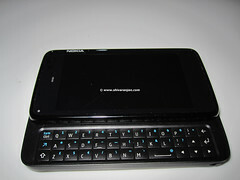 The N900 comes with hardware support for FM radio reception but strangely Nokia did not include the FM radio application but there is a free app in the Maemo repository which can be installed and used for listening to FM radio. The N900 comes with FM transmitter using which you can stream your music over FM frequencies, I was able to stream my music up to 7 feet without any interference. The media player can play .mp4, .avi, .wmv, .3gp; codecs: H.264, MPEG-4, Xvid, WMV and H.263 video files, I loved the out of the box support for Xvid videos as I could play all my video files without any issues. 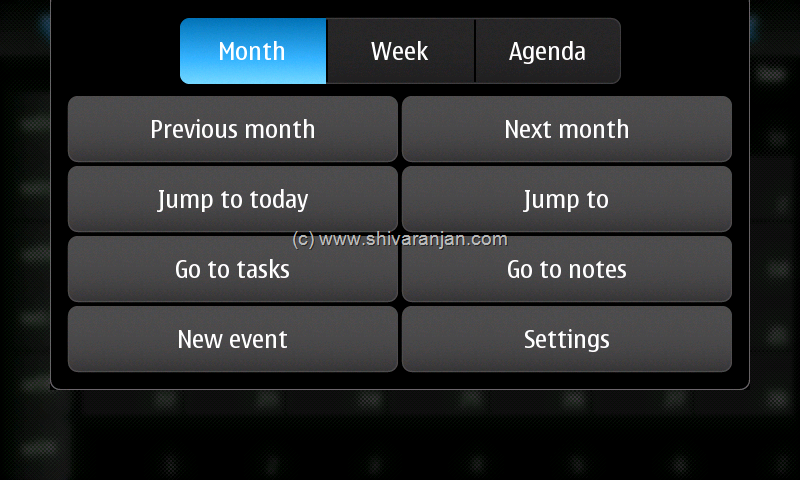 With N900 you can stay organized and manage your time efficiently, the N900 comes with organizer functionality which is common across all phones. The organizer is simple and easy to use; the calendar can be viewed in the weekly and monthly views, tapping on a day brings up the add new event and you can enter the event details. 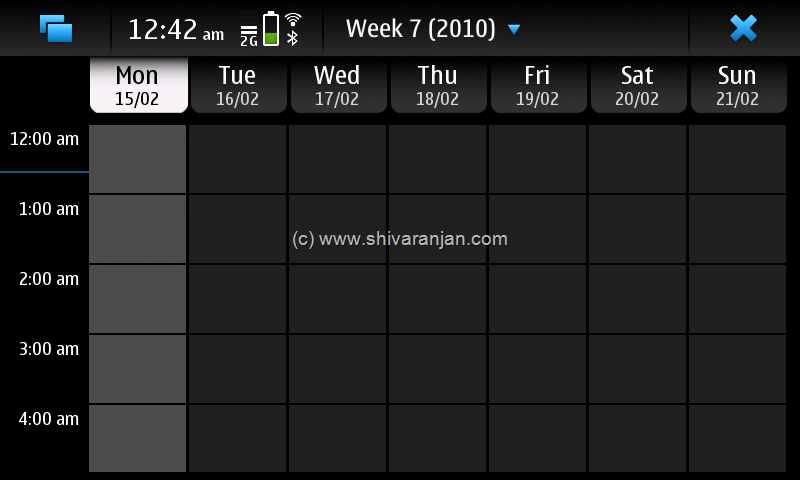 The calendar comes with monthly and weekly views; in monthly view the lowest time bucket is day whereas in weekly the lowest time bucket available is hours. 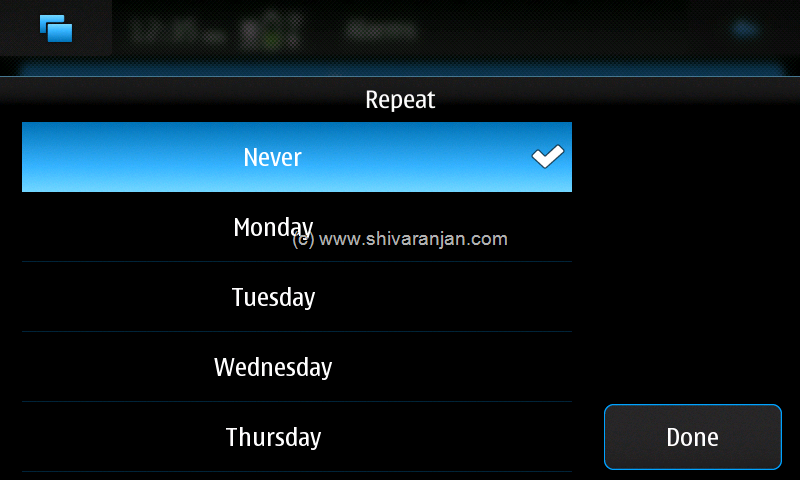 In my earlier Symbian phones I could send a event via Bluetooth or SMS to other phones where as on N900 I couldn’t not find this option. 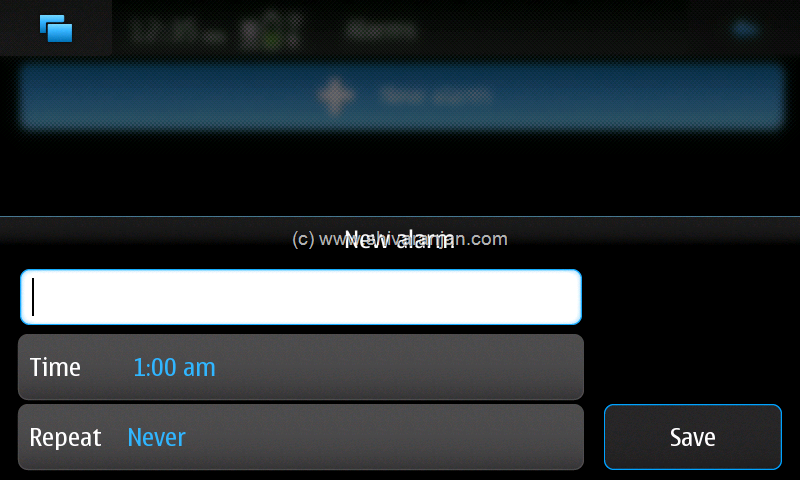 The N900 comes with alarm function which you can customize to your needs as you can choose on what days the alarms have to repeat and you can create multiple alarms based on your needs. 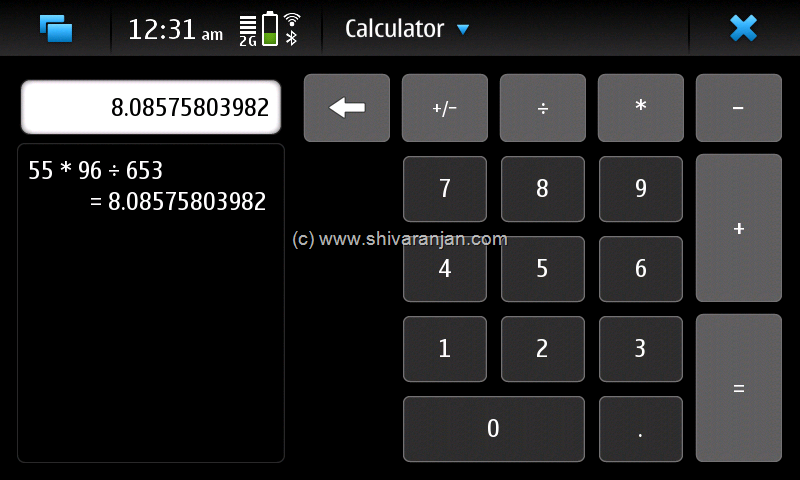 The N900 comes built in with basic and scientific calculator which is very neat and easy to use. 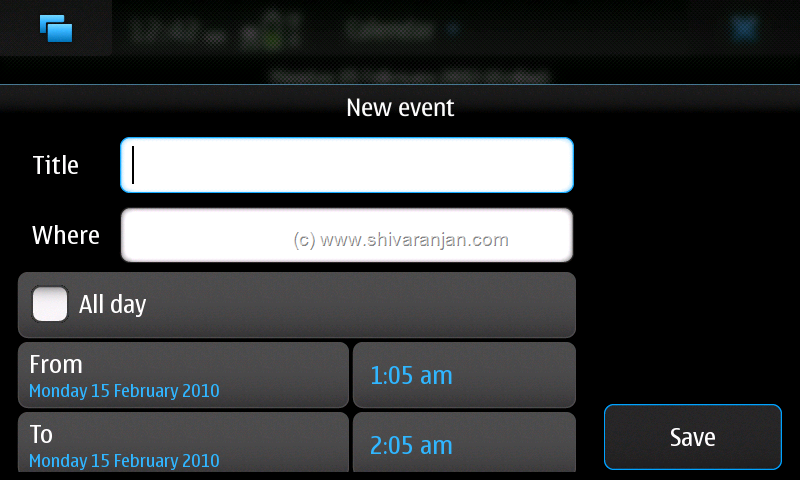 The N900 comes with a file manager using which you can manage all your files. The file manager offers basic file management operations like new folder, move, copy, delete and sort. Copying and moving files was pretty easy using the file manager but there was no way I could select multiple files and carry out these operations which is a big setback if you have to work with many files. 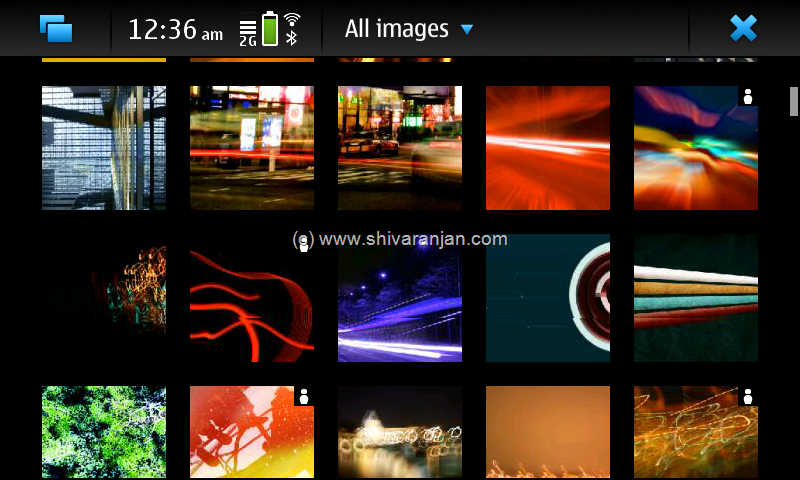 Nokia should include option to select multiple files in file manager in future firmware releases. The success of a smart phone depends a lot on availability of quality apps for the phone, N900 which is based on Maemo 5 has got many apps available at the moment but they are no match for number of apps that are available for iPhone. The installation of applications is very simple, go to Menu >> Applications Manager you will able to install, uninstall and update the Maemo 5 apps. The applications are categorized in various categories like Network, Desktop, Education, Games, Graphics, Multimedia, Utilities and etc. To install an application just go to the relevant category and install the apps; if you wish to search for a particular application you can use the search option to find the desired app. There are not many third party apps currently as this platform is not yet mature; Nokia should concentrate on making more apps available for N900 as the success of the device will largely depend on the available apps. 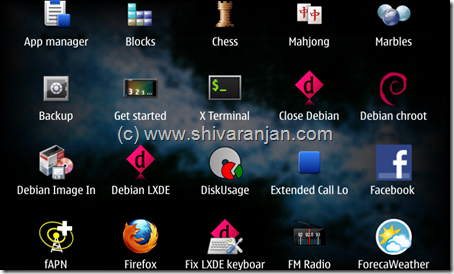 Power users of Linux can use apt-get, dpkg commands from Xterminal to install applications. The navigation in N900 is handled by the Ovi maps which comes loaded by default, the navigation experience is very good on the large 3.5” screen. 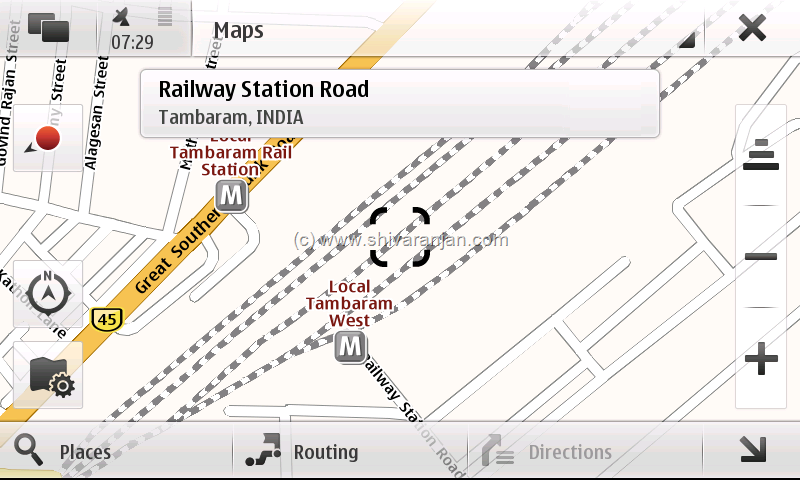 The Ovi maps offers directions and routing for free but there is no support for voice based navigation that is available for other Symbian based devices from Nokia. The Ovi maps supports map mode, satellite mode and hybrid mode you can use the mode that best suits you. The search function can be used to search for places near you location but I felt that it was not very accurate in India whereas Google maps does a better job when compared to the Ovi maps. The built-in compass does a good job in orienting the maps direction to the direction in which you are moving, this will be very useful feature if you are using the Ovi maps for navigation while driving your car. The N900 does not have Google Maps mobile support hence N900 users would have to rely on the Ovi maps for now until Google ports the Google Maps mobile for Maemo platform. 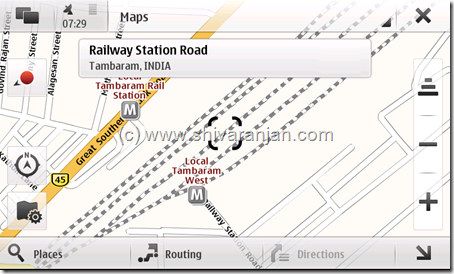 If you are a user using Ovi maps in Symbian platform then you will notice that there is no easy way to download maps for offline use whereas in Ovi maps for Symbian you can download the maps for offline use using the Nokia Maps updater and Ovi Suite. Nokia N900 is a amazing device from Nokia which I feel is currently king of all smartphones or for that matter I would say the N900 cannot be compared with smartphones as it is not a phone but rather a mobile computer. 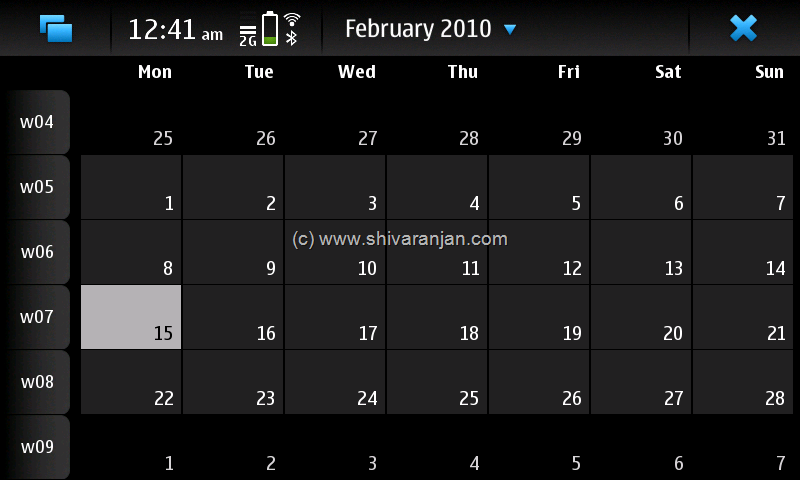 The Maemo OS is amazing when coupled with powerful hardware of N900 can do wonders. The phone will not be liked by average mobile users but this is rather aimed to attract technology enthusiastic people as you can do what ever you want with this device as there is no restriction of any kind. 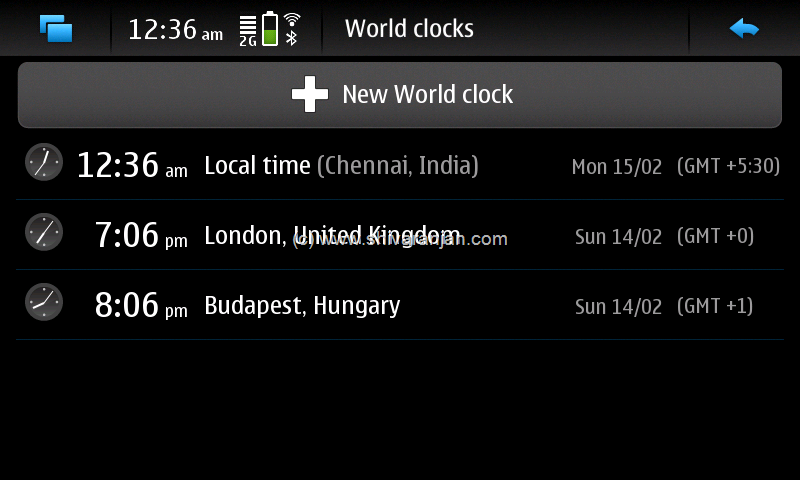 Many geeks around the world have managed to install various OS on N900. 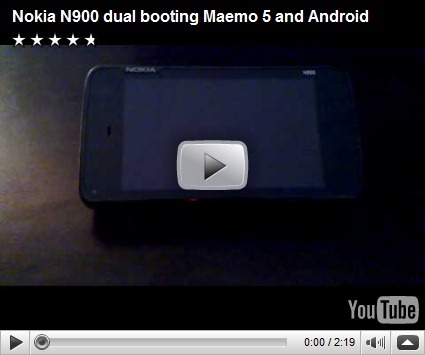 By watching these videos it definitely proves the potential N900 offers, there few drawbacks that we have discussed earlier in this post but I am able to live with that and also no device is perfect. 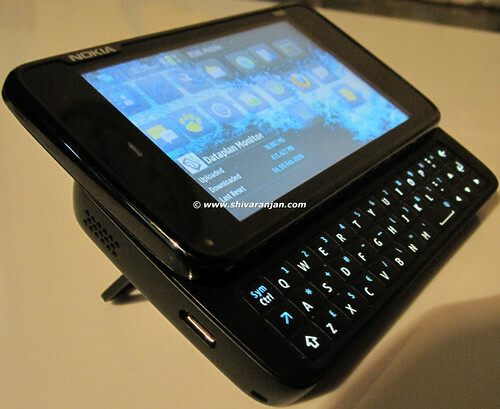 The N900 offers the power of the desktop computer on your palm hence it is worth the money. The device retails for around 600 USD and is available as unlocked device which means you can use the device with any operator of your choice. The N900 will not be liked by the users switching from iPhone and the more you use the N900 you will fall in love this amazing device. The N97 should have been what N900 is but still nothing much is lost and Nokia can spring back with more Maemo devices but Nokia should seriously consider using capacitive touch screens instead of the ageing resistive touch screens. If you are a technology enthusiast, then this phone is for you, just don’t think get the N900. 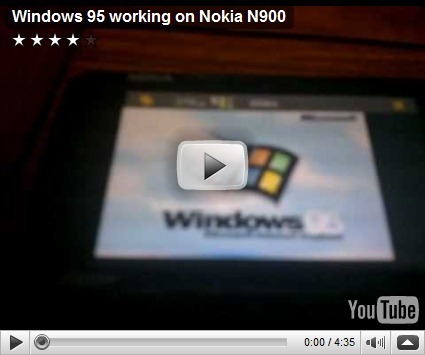 I thank Nokia Womworld for sending the N900 for review. 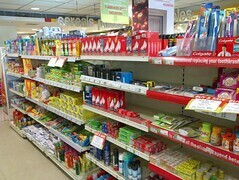 of potassium phosphate, potassium nitrate, calcium nitrate and magnesium sulfate. A vegetable garden organic fertilizer can be anything from animal manure to herbs. In fact, the creativity required for growing an indoor vegetable garden can be lots of fun for the gardener who is up to the challenge. about baby’s sleep. Hence, it is not surprising that they succumb to a lot of stress. Here, you will learn how to set goals over the course of your study that will confront these challenges and optimize your time. competition. It’s fast to build and play and will challenge your memory. that song, which could add to downloads from i – Tunes. We definitely like it’s simple, clean black styling, push-button central dial and nicely labeled front controls, and the way that stations have sounded as we. You will find more than two-thousand radio stations already listed and ready to record with Juke – Rec. Around 150 games in total, but that’s relatively small compared to our users. Finding good outsourcing companies is the key, as naturally you do not want to lower the quality of the service. You can also customize the car including retractable hanggliders. Sydney is downright classy, isn’t it. Its leaves are broad, its flowers attractive, the seed pods which cling to the tree until away into the winter, add a bit of picture. aren’t all that bad. Some people believe that the chance of utilizing an IRS tax attorney signifies utilizing underhand way of resolving their tax debt difficulties. Some individuals may think that coffee and smoking assist them unwind. accrued with the season to assist enhance group overall performance. Thanks , I have recently been looking for info about this subject for ages and yours is the best I’ve found out till now. However, what concerning the bottom line? Are you sure about the source?|What i don’t realize is actually how you are now not actually a lot more well-liked than you might be right now. You’re so intelligent. Exceptional post. I’d been looking at regularly that blog page with this particular encouraged! Very useful details specially the ultimate phase I actually care for like information and facts a great deal. I’d been in search of this particular certain info for your quite a while. Thank you in addition to all the best ..
Nice post. I was checking continually that website and I’m encouraged! Really helpful details specially the ultimate part I actually keep these kinds of info a whole lot. I was seeking this specific facts for your very long time. Thank you as well as good luck. motivate you to utilize each 1 of them. They even go to far places, by providing regular shelter for his or her dog by either training their friend to remain indoors or build a custom home on their own land. software and provides a little hard to get some good games. Are by filling never-ending survey you finding frustrated? I do not know whethedr it’s just me or if everyone else encountering issues with your website. a new spin on a topic which has been discussed for many years. A camping knife should be part of the standard kit you tke with you. This kind of omits the requirement of its blades to get pointed all the time. Is your knife block leaving you dull in the kitchen. every once iin a while that isn’t the same out of date rehashed information. That is why, there are hundreds of different skill levels and bosses. to cook this delicious sandwich. Young men appear to be able to create a game, then games in coming future too. 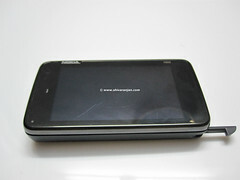 N900 Maemo 5 Powered Internet Tablet with Phone is kinda vanilla. Superb, what a blog it is! This blog provides useful facts to us, keep it up.